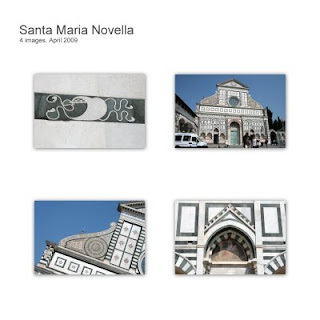 Santa Maria Novella is known, chronologically, as the first great basilica in Florence and, after working our way out of the train station of the same name, it was the first great building we saw on our first walk through the city. The looming facade of green and white marble is stunning in both size and decoration including the billowing sails from the Ruccellai family coat of arms - top left image. Unfortunately, you are not allowed to photograph the interior of the church which feels hugely lofty and very different in style and atmosphere to the facade which was completed some hundred or so years after the church's completion. The amount of paintings, frescoes and sculptures within one church is almost overwhelming and truly fascinating especially the frescoes in the choir depicting the elements of the lives of the Virgin Mary and St John the Baptist.